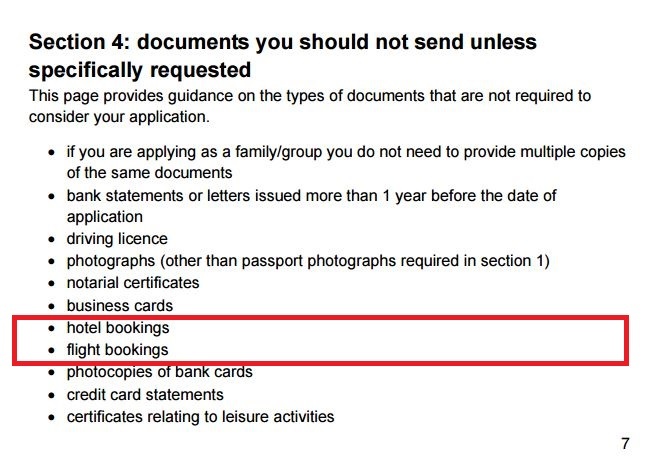 It seems like that this question has been asked for visas to other countries, but I am not sure if it applies juts the same for a UK short-term visit visa. I want to visit UK for 2 weeks and the visa asks for the "details of where you’ll be staying during your visit". In the application, I need to provide the address and phone number of where I'll be staying. Is the normal approach to this (assuming I plan on staying in hotels or hostels and have no family members there) to just book a refundable hotel reservation? Also, if I plan on visiting several different cities in UK (ie. London, Manchester, Edinburgh), should I just put the first place I am staying at on the application? I can then attach an itinerary of the trip with the address and phone number of a hotel booked in each city for the duration I am there. I plan on staying in hotels or hostels and have no family members there) to just book a refundable hotel reservation? Following your guidance, I am not including flight and hotel reservations until specifically requested. I am happy to make a personal appearance at the British Consulate to show these once the visa has been issued. If you are visiting multiple locales, include a proposed itinerary. If you are staying with private hosts as in a family visitor, include their address. Otherwise include an indicative entry for each location. Note: "hotel bookings" include hostel, AirBnB, or any similar accommodation arrangement. Not the answer you're looking for? Browse other questions tagged visas uk hotels or ask your own question. Is it possible to use hostel booking for a UK Standard Visitor visa application or must it be a hotel? Does the hotel need to be fully prepaid before applying for a Swiss tourist visa? Can I book a different accommodation after receiving my US visa?